This Slimline Personalized Leather Wallet with Magnetic Money Clip is perfect for a night on the town or a weekend trip! 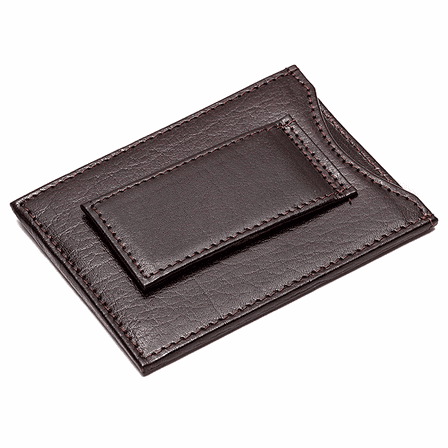 It's available in black leather, with a magnetic money clip that holds 7-10 folded bills. There are slots for 3 credit cards on the front, and a center slot that holds 2-3 more credit cards or business cards. 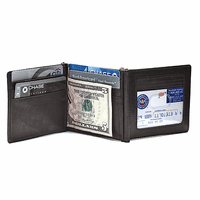 The slimline wallet measures 2 7/8" x 3 7/8" x 1/4", and is lightweight and streamlined to carry in your front pocket! It comes packaged in a gift box, and you can make your gift extra special with up to 3 hot stamped letters on the lower front corner. To add free custom personalization, just enter your lettering in the personalization field. Dimensions: 2 7/8" x 3 7/8" x 1/4"
It shows a picture in brown, but only lists Black as the color, is brown available? We are out of stock on the brown, sorry! I am trying to personalize this item, When I preview the personalization I can only see 4 letters, What are the guidelines to personalizing this item? 4 letters is the maximum you'll be able to fit on this item. Most customers go with initials for our leather items. I Have the older slimline with the strong magnet. Does the newer ones have the same strong magnet in the clip? The magnet is not quite as strong as it used to be. They still have a strong hold but they made them a little less strong so that they wouldn't damage credit cards. For the personalization, are all letters the same size or is the initial of the last name taller? Should I put initials for first, then middle, then last name or put the last name initial in the middle? 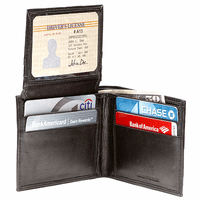 I'm looking for a magnetic money clip credit card holder that can be personalized. I can see that this one can be personalized, how is the personalization done? 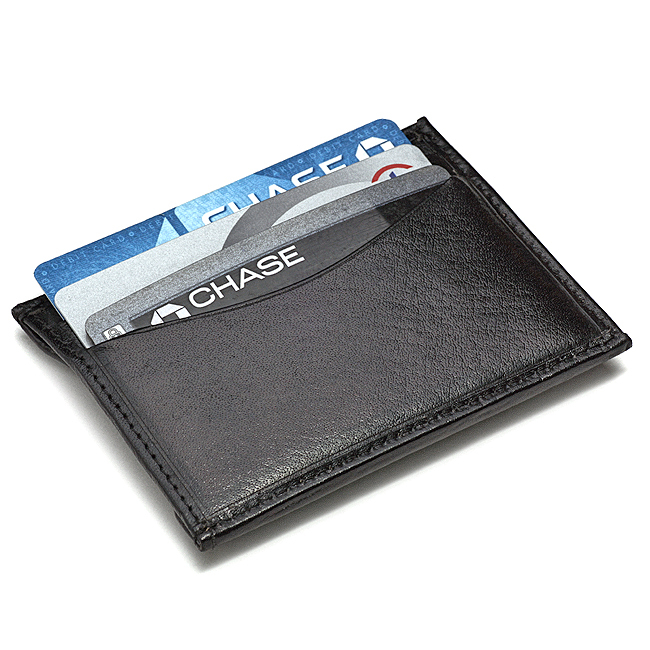 Also, will the magnetic money clip ruin my credit cards? We use a hot stamp to brand your letters right into the leather. The magnet will not damage your credit cards. The magnets in money clips are not nearly strong enough to have any effects on your cards. Approximately how many credit cards will it hold well? 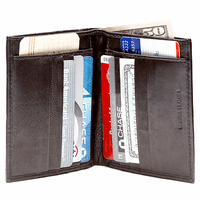 This wallet with money clip can hold up to six credit cards. Three in the front slots (one in each slot) and 3 more in the center pocket. Wonderful product. Ordered two as gifts. Delivery was very quick. Very happy with my choice. I gave this wallet as a gift to my boyfriend. He loved it,especially having his initials on it. It's only been a week since he had it but no complaints so far! I purchased this for a Valentine's Day gift for my husband. He loved it! Great quality, fast shipping. I'll definitely be ordering again! Gave to my son. He really likes it. Purchased this for my boyfriend . Heard great things about it . Well it didn't disappoint . It is handsome looking and functional at the same time . Perfect size... Had it personalized and shipping was fast . If you are on the fence ... Wait no more! First time ordering from site; product was outstanding, service excellent. Would order from them again. ProsFree engraving, quality of product, efficient service and quick delivery. Got this for my 22 year old son - he absolutley loves it - very high qulaioty, easy to carry, and monogram looked awesome. This is a great product - I hit a homerun with my son! This money clip is useless & I had it monogrammed for my husband. The magnet is not strong enough to hold more than a couple of bills. I am totally unhappy to have spent money on something that can't be used at all! ConsWe're so sorry you're unhappy with this. 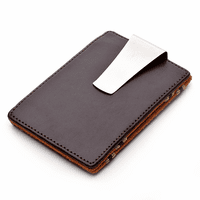 We'd be happy to send you a different money clip and/or wallet. Would that work? If so, please email us at help@executivegiftshoppe.com with your order # and/or the name your order was placed under. If you'd rather just return this item for a refund, that's alright too, just email us. This wallet blows any other I've ever had out of the water. It feels great, it's light, and if you don't have a ton of cards to carry, it's perfect. Plus you can keep cash too. Definitely recommend this to anyone looking. I must bought this for my husband, who runs through a wallet/money clip combo about once a year, when the money clip spring breaks. He always buys the hinged money clip type, so I was not certain he would like the magnetic clip, or even that it would work. It works perfectly, is slim, great quality and he loves it! Everything I wanted. Slim profile with just enough space to hold the couple of cards that I require to carry. Great product. It is exactly what we wanted! Nice magnetic clip is strong and durable. High quality leather and the embossing is a very nice personal touch. Would recommend to anyone not wanting the bulk of a wallet. I have given this wallet as a gift twice and the recipients were very glad to receive the gift! It is unique and it works well! This was purchased as a gift for a sports enthusiast who did not want to take his large wallet when he played golf. 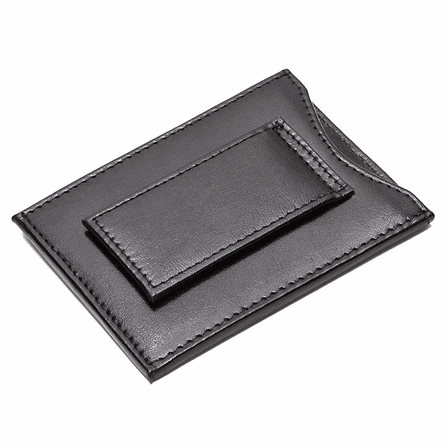 This is the perfect mini wallet - so he can leave most of his wallet contents at home and just bring the important items like ID, 1 credit card and some cash. The product is good. The card spots are a little smaller then I would like them to be. It took a week or two to strectch out the spots so you could put more then one card in each slot. Overall good product, very neat. Been using it for months. Just the right size and holds all of the cards I need it to. Finally a perfect replacement for the old full size wallet.